If your order weighs less than 13 ounces, save huge on shipping with USPS first class (with tracking number). This product weighs 1.8 oz. 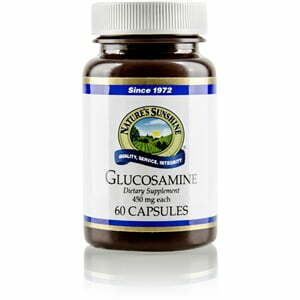 Nature’s Sunshine Glucosamine is a key source of nutrients for joint and cartilage health. Throughout the aging process, the body manufactures fewer of the elements that are essential for joint function such as glucosamine. When supplemented, glucosamine collaborates with chondroitin and other similar nutrients to enhance cartilage rebuilding and maintenance processes. 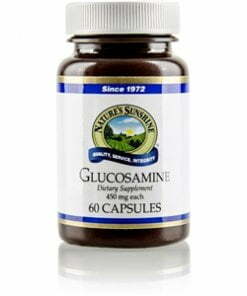 Nature’s Sunshine combines 400 mg of glucosamine with uña de gato, an herb that nourishes the structural system. Instructions: Take two capsules with a meal twice daily. Drink one glass (8 ounces) of Nature's Spring water with the capsules. Cellulose (plant fiber), maltodextrin, magnesium stearate (vegetable), gelatin, and water.